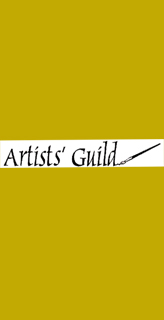 The Goal of the Artists' Guild is to establish a place for the exchange of ideas and information, and to provide support and fellowship. We welcome aspiring artists, beginners and experienced, or just lovers of the arts. Our members enjoy the talents of calligraphers, painters, photographers, sculptors, woodcarvers, woodburners and many other related fine arts. At present the Guild has two public showings per year. Sunday in the Park - host the judged public art show in the city park. Cash prizes and ribbons are awarded. We give two or three scholarships to high school graduates pursuing a college degree in an art field. 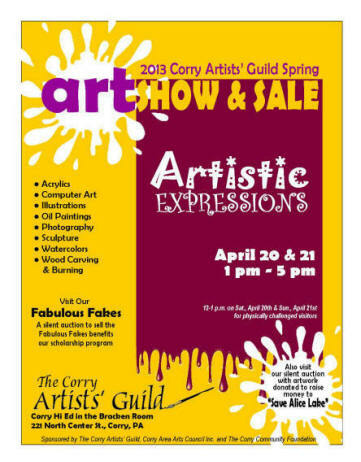 We also offer art related field trips and workshops to our members and display artwork in local businesses. Our members also artistic aid to schools, churches, libraries, community theatre and events in the area. 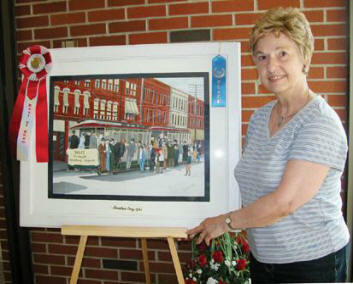 Pictured above is Diann Bova of Corry with her painting which was chosen Best of Show at Sunday in the Park on August 5, 2012.